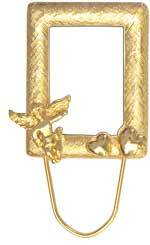 Blessed By an Angel, the 22k gold plated Angle pin that Blesses, your photo and protects your Glasses! Just follow these steps on the left . Once you've approved your photo preview be sure to save it so you'll have a chance to go directly to the shopping section to place your order. your photo will be cropped and placed in the pin that you chose exactly as you see it on the screen. 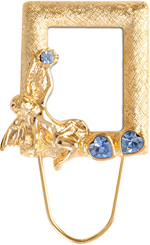 Did you know we can create customized pins to carry whatever you imagin from your companies Logo, to your Initials at a very reasonable price, just let us know. 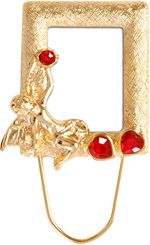 Select the Angel pin you would like to preview. Click on the browse button to locate the picture you would like to see in the pin, you will have to browse through you computer to locate it. Keep in mind that your photo must not be larger than 4 MB. once you've selected your photo, click the Upload button below. " depending on the size of your photo, and the speed of your internet connection, the upload process maytake a few seconds to a few Minutes.